Make strength training a lifetime habit! 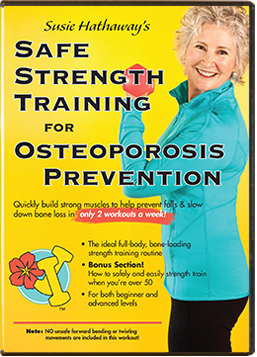 Here are 4 tips on starting an exercise program for osteoporosis prevention that work for the women in my strength training class, all in the over-fifty age group. Make it gradual. It’s well worth your time to ease into any new exercise program. You don’t need to start with a huge overload. 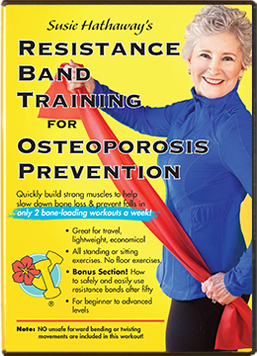 Working a little bit harder or longer than what you’ve been doing in any activity will help your muscles get stronger safely, which in turn, creates a stronger beneficial pull on your bones that can help prevent osteoporosis. If you jump into it too hard or too fast, you could strain a muscle or tendon and not be able to exercise while it heals. Slow and steady wins this race! It’s also wise to discuss starting a new exercise program with your health care provider and follow the safety precautions if you have bone loss. Make it progressive. When an exercise is no longer moderately challenging, raise the intensity. Work moderately hard, but don’t strain. Small, progressive increases in weight bearing and muscle strengthening exercises “wake up” your bones, reminding your skeleton to do its job of staying strong and supporting your body. You’ll be amazed that by consistently increasing your dumbbell weight by 1/2 to 1 pound, when you’re ready, or making your walks a little faster or longer, you’ll gradually work up to being very strong, helping your bones slow down bone loss. Get outside with friends this summer! Make it social! 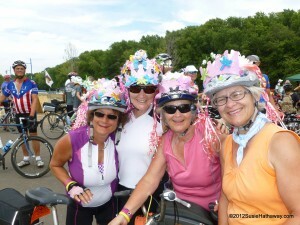 Buddy up with a friend or find a group that loves to be active. Looking for the motivation to get out of bed and give exercise a high priority on your schedule? Commit to a friend to walk, ride a bike, or join a class. It will get you there, plus it’s way more fun. Use it or lose it. You might have risk factors that affect your bone loss that you can’t do anything about, such as heredity, medications, being female, a small frame, medical issues, to name a few. 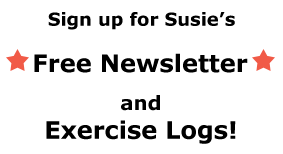 But, incorporating an active lifestyle is something that you CAN do something about! It’s a lifetime commitment, or else bones and muscles go back to their “energy saving” default settings and get rid of those precious tissues if they’re not being used. Use it or lose it definitely applies to bone and muscle. Bone is living tissue and responds to the good stress of exercise. Find ways to permanently add physical activity to your daily calendar for the many fabulous health benefits it offers. The quality AND quantity of your life will be affected. What are some ways you eased into exercise (or didn’t!) when you first began? 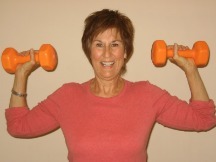 Just got inspired by Susie’s tips to incorporate strength training into daily activities. I found I can blow dry my hair and do 25 squats!